An abstract landscape from a viewing area high above. 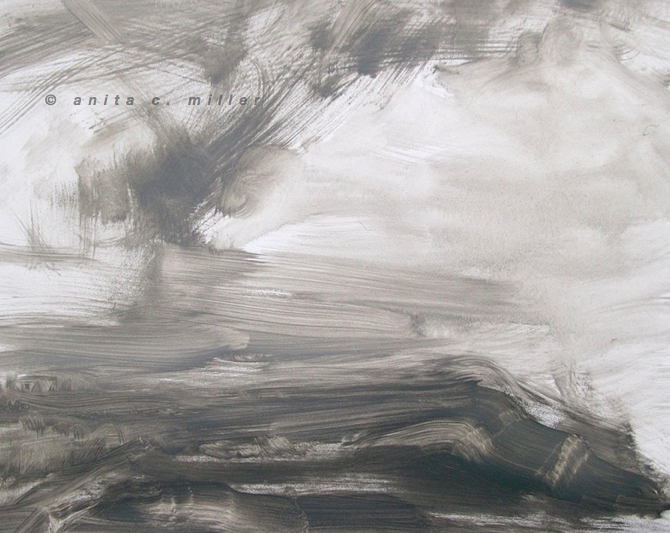 The way you’ve rendered that movement up towards the sky in the first painting, Anita – UNREAL! You can just tell that this piece was spontaneous (and if I’m wrong, you’re excellent at fooling your viewer.) I love these small little gems! Patricia, thanks so much for your comments. That is exactly how it happened — very spontaneous. I was standing at the easel trying to figure out how to paint those big fluffy clouds. I started painting the area around the clouds and just discovered the movement by actually doing the painting. So, I learned it’s best not to overthink these things. Doing is more important than thinking sometimes. Doing IS more important than thinking much of the time. Thank you for saying so. Thanks for your comments. Also, I forgot to say that even though I think I know how I want to paint something, it most often turns out different… so now I just try to do something and then react to what I’ve done. Hope that makes sense. Reminds me of “The Inner Game of Tennis” (book) (zen) ..”let it happen”. Let go.. trust an intelligence below your consciousness. I don’t know why I am so taken with your stuff. I guess it doesn’t matter, I’m just letting it happen. Ha.